This publication is for anyone who is interested in promoting the wellbeing, learning and development of children who spend any part of their time in after school services on a regular basis. The main focus of this publication is to enhance understanding of what children of this age need in after school settings and to support those delivering services to meet those needs through a high quality programme of activities. 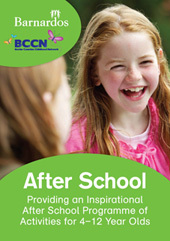 After School: Providing an Inspirational After School Programme of Activities for 4–12 Year Olds consists of a book and a CD. The book is looks at the what, the why, and the how of after school services giving background information, things to think about, ideas for practice and examples of activities. It sets out the context for after school work by providing a brief overview of provision in Ireland and other countries, information on children’s social and emotional learning, an understanding of the importance of play and types of learning modalities for children in this age group within a programme that is well-balanced. The book also looks at particular issues in relation to after school, such as transitions, homework, project-based learning activities, technology, the arts and natural environments. The CD then sets out 230 activities that can be carried out in an after school setting to enhane children’s learning and support their ongoing development. This publication was offically launched at the BCCN/Crann After School and Outdoor Play Conference in Navan on 21st September. Copies can be ordered online at www.barnardos.ie or you can email resources@barnardos.ie or call them on 01 4530355.